How to MULTIPLY, DIVIDE, ADD and SUBTRACT with simple potentiometer circuits. WHEN we think about arithmetic, we think about addition, subtraction, multiplication and division. Algebra extends the usefulness of arithmetic by employing symbols for quantities. Trigonometry brings into play the relationship between sides and angles of triangles. Using one or more of these three mathematical approaches, most of the design problems encountered in electronic equipment can be solved. And since these branches of mathematics are required so frequently, long-hand “figuring” is becoming antique and impractical. New techniques of calculating include the principle of analogy. Some physical quantity is used to represent the unit one. For example 1 inch may equal the unit 1 or 1 pound may equal the unit 1. Thus 5 would be represented by 5 inches or 5 pounds. These quantities are then physically added or subtracted, and the remaining quantity is actually measured or weighed to determine the answer. Since mechanical analogies are bulky and sometimes expensive, electrical quantities are more convenient in most cases. You can multiply a voltage by amplifying it. However, an amplifier usually has constant gain, and in order to create a variable multiplier, a gain control (potentiometer) must be included. The potentiometer can then be calibrated in terms of multiplying units. If a large enough voltage is used and the read-out (indicating) voltmeter is sensitive enough, no amplifier is necessary. A potentiometer calibrated from zero to 10, or zero to 100 can be used to simulate multiplication, although it actually performs division. Figure 1. If an input of 10 volts is applied across the end terminals of a linear potentiometer, 1 volt will exist across terminals 1 and 2 when the shaft is rotated one-tenth of the way from terminal 1 toward terminal 3. When the shaft is rotated an additional one-tenth (or a total of two-tenths) of the way toward terminal 3, 2 volts can be read. This relationship holds all the way up to the number 10 (at full rotation) where the voltage will be 10 volts. Thus, a simple pot can be used to generate the numbers from one to ten. If intermediate points are calibrated, numbers like 2.3, or 5.8 are easily generated. If a second pot is connected with its end terminals across the terminals 1 and 2 of the first pot, the second one will “multiply” the number generated by the first. 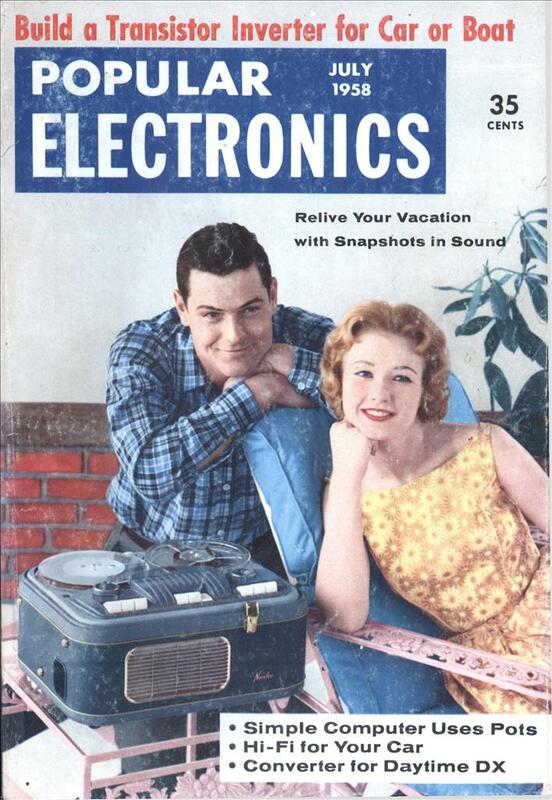 (See After Class in May 1958 Popular Electronics, pages 76 and 118, for alternate circuit and additional explanation.) Figure 2. In this simple two-number multiplier, voltage is furnished by a flashlight battery when the momentary contact switch SI is pushed. Real is the calibration control, potentiometers A and B are operational multiplier elements, and a voltmeter is connected across the output terminals. Use one flashlight cell if the lowest scale on your voltmeter is 1.5 volts or less; use two cells for 2.5 volts. If the lowest scale is greater than 2.5 volts, but less than 4.5 volts, use six cells in series-parallel to furnish 4.5 volts. (Pots with asterisks in Figs. 2 and 3 are Clarostat Type 58C1.) The circuit in Fig. 2 will yield most accurate results with VTVM’s and voltmeters having sensitivities of 5000 ohms per volt or greater. For voltmeters with sensitivities between 5000 and 10,000 ohms per volt, Real should be connected as a series rheostat by breaking the connection at the point marked X. A fixed series resistance may have to be inserted in the lead at point Y which can be determined experimentally. To calibrate: (1) connect your voltmeter to the output jacks and set it to the lowest d.c. volts scale; (2) set A and B full clockwise beyond 10 on the scale marked Linear; (3) push switch SI and adjust calibration pot for a full-scale deflection of the voltmeter if you have a scale on your meter that is a multiple of one (i.e., 1, 10, or 100 volts)*; (4) adjust the dial knobs on potentiometer A and B shafts so that zero meter deflection is not experienced until the hairlines cross the zero mark; (5) check accuracy by moving pot A to the whole number markings from zero to 10 with pot B on 10. Record meter readings. Repeat with pot B being moved and pot A set to 10. If the results are not accurate, you may be able to improve them by resetting one of the pointer knobs on the shaft. Suppose you want to multiply 4.7 x 6.9. Perform calibration adjustment (3). Set 4.7 on one pot and 6.9 on the other, and read the result, 32.4, on the voltmeter. Note that the proper scale factor must be used in reading your answer. Thus, if you had wanted to multiply 47 x 69, you would have assumed the potentiometers to be calibrated from 0-100 instead of 0-10, and the answer would have been read as 3240. As with analog devices in general, the answer is not exact. It is, however, sufficiently correct for most engineering purposes. Practice may be required for correct scale interpretation. The dial knob pointers can be made from thin plastic. Scratch the line with a pointed tool, using a ruler as a guide. Then allow a small quantity of India ink to flow into the scratch to produce the hairline. The plastic pointer is cemented to the knob. 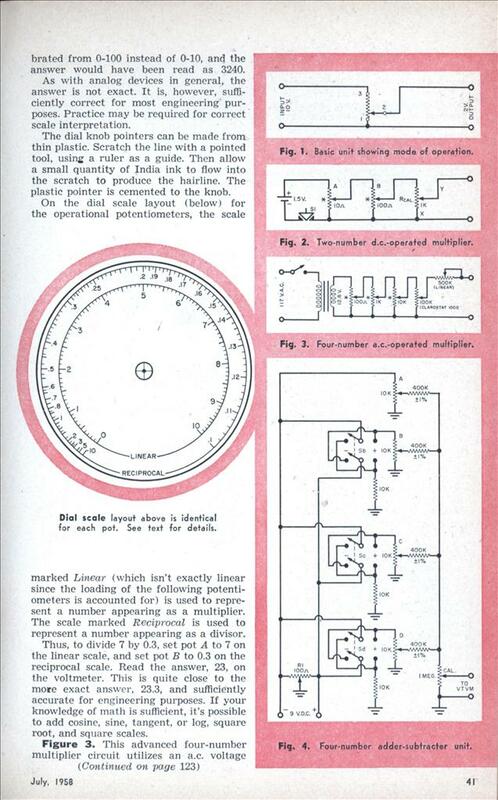 On the dial scale layout (below) for the operational potentiometers, the scale marked Linear (which isn’t exactly linear since the loading of the following potentiometers is accounted for) is used to represent a number appearing as a multiplier. The scale marked Reciprocal is used to represent a number appearing as a divisor. Thus, to divide 7 by 0.3, set pot A to 7 on the linear scale, and set pot B to 0.3 on the reciprocal scale. Read the answer, 23, on the voltmeter. This is quite close to the more exact answer, 23.3, and sufficiently accurate for engineering purposes. If your knowledge of math is sufficient, it’s possible to add cosine, sine, tangent, or log, square root, and square scales. Figure 3. This advanced four-number multiplier circuit utilizes an a.c. voltage input as an energy source and an audio VTVM for the read-out device. The audio VTVM must be used since output voltage becomes small for most calculations. It is possible to multiply four numbers like (27.2 x 11.3 x 7.57 x 928) in one operation. A calculator utilizing this circuit has been built whose error was less than 2% total, or 1/2% per number entering the calculation. Dial scales are the same as those for the two-number multiplier. Figure 4. With this four-number add-subtracter circuit, you can solve problems like (1.2 + 4.6-7.2 + 9.6) in one setup. Balance control R1 is adjusted for equal positive and negative voltages from ground to potentiometer R1 end terminals. The “add-subtract” switches Sb, Sc, and Sd allow the polarity of the voltage to the respective pots to be changed so that the numbers represented may be made positive or negative. Currents through the 400,000-ohm resistors are proportional to the potentials at the potentiometer arms. The currents flow through the 1-meg. calibration pot where they are summed. To calibrate: (1) balance the ± balance control (R1) with pots A, B, C, and D set to 10, switch Sb set to (+), and Sc, Sd set to (—); with the output connected to the VTVM, R1 is adjusted for zero deflection of the VTVM on the lowest d.c. voltage scale; (2) switch Sc and Sd to the + position without changing any other control settings, and set the 1-meg. calibration control for a deflection of the VTVM of 4 volts. At first I thought it was about surfing the web while but after reading the article this is really neat, its sort of like an electric slide rule.